If the notion that history repeats itself is accurate, it is nowhere truer than in the Middle East where the international community, caught by surprise by the 2011 popular Arab revolts, has reverted to opting for political stability as opposed to sustainability, ignoring the undercurrents of change wracking the Middle East. Major powers do so at their peril. The failure of the United States, Europe, China and Russia to recognize key drivers of fundamental societal change and revisit the underpinnings of their policies towards the Middle East and beyond threatens to nullify professed aims of wanting to end bloodshed, curb extremism, stabilize the region and protect their interests. In a just published study, Jose Antonio Sabadell, a former Spanish and European Union diplomat, argues that the narrow focus of the West, and by extension of China and Russia, on countering extremism, stemming the flood of refugees, and securing economic interests, blinds major powers from recognizing tectonic social and political shifts that are likely to reshape a region embroiled in volatile, often violent transition. Without saying so explicitly, Mr. Sabadell harks back more than a decade to the immediate aftermath of 9/11 when Western leaders, including then US President George. W. Bush recognized that Western support for Middle Eastern autocracy that failed to address widespread popular grievances and perceptions of Western policy had created the feeding ground for jihadist groups focused on striking at Western targets. That recognition produced an expectation that the Arab street would assert itself, neutralize breeding grounds of extremism, and counter radicalism by pushing for political and economic change. When the Arab street did not immediately revolt, government officials, analysts and journalists wrote it off. The widespread discontent continued to simmer at the surface. It was palpable if one put one’s ear to the ground and finally exploded a decade later in 2011. That pattern hasn’t changed despite a brutal counterrevolution that reversed the achievements of the revolt in Egypt and produced civil and covert wars and/or overt military interventions in Libya, Syria and Yemen. Just how little has changed is evident in the continued validity of Egyptian-born political scientist Nazih Ayubi’s assertion 22 years ago that the Arab world is populated by hard rather than strong states whose power is rooted in bureaucracies, militaries and security forces. Recent protests, often innovative in their manifestations, in Morocco, Egypt and Iran prove the point. “The Arab world is in the middle of a process of deep social and political change… The emergence of Arab peoples as key political actors, in combination with widespread, profound and mounting popular frustration, is a game changer. What Arab populations think and crucially how they feel, will determine the future evolution of their countries,” Mr. Sabadell predicted. Historical record backs up his assertion that fundamental change is a process rather than an event. The era of the 2011 revolts and their counterrevolutionary aftermath may be reminiscent of the 1789 French revolutionary wave that was countered by powerful conservative forces that ultimately failed to avert the 1848 revolution. A renewed failure to recognize the social psychological, emotional, social, economic and political underpinnings of simmering discontent suggests that the international community’s focus on migration and extremism could boomerang by further antagonizing significant sectors of societies in a swath of land that stretches from Africa to China. It is likely to impact stability in a region that borders on Europe, constitutes Russia’s backyard and soft underbelly and stretches into China’s strategic north-western province of Xinjiang. It also risks fuelling rather than countering extremism that feeds on its understanding and exploitation of the emotions, social psychology and identity politics of deep-seated grievances. “We are at a crossroads… Vital interests are at stake…. These developments will define…interaction with 400 million people living in Europe’s immediate neighbourhood, and shape relations with the wider Middle East and North Africa region… This can have profound geopolitical implications, influence the global scenario for the foreseeable future and maybe change the nature of international politics,” Mr. Sabadell said. Demonization of Islam in the West and major Asian nations as well as political Islam that is encouraged by autocrats in countries like Saudi Arabia and the United Arab Emirates despite the fact that religion is often the only permissible language in public discourse, and Islamophobia, magnify the risk and exacerbate the problem. The centrality of Islam in Middle Eastern identity coupled with widespread anti-Western sentiment that is reinforced by the Trump administration’s immigration policy and anti-immigrant sentiment in Europe strengthens a belief that the West, and eventually China with its repressive policy in Xinjiang, is hostile to Islam. It’s a belief that hands opportunity to extremists on a silver platter. 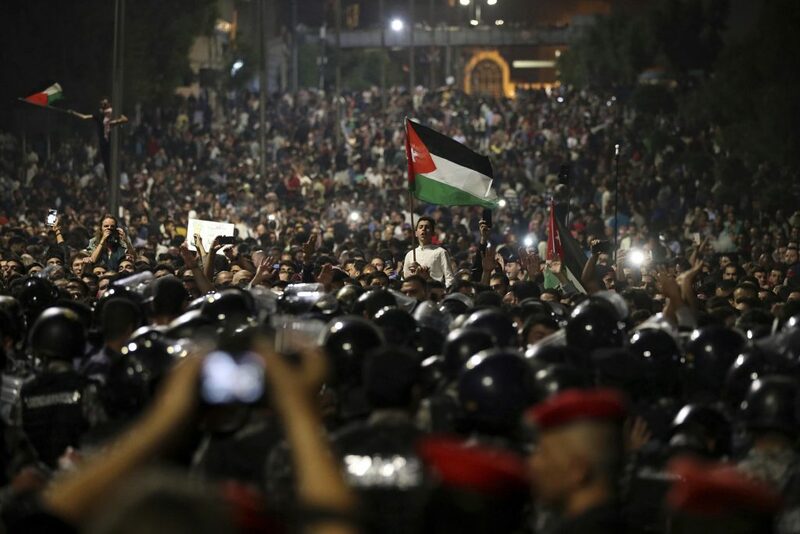 The key popular demand for dignity that characterized the 2011 revolts as well subsequent protests related as much to calls for clean, non-corrupt governance and efficient delivery of public goods and services as it did for acknowledgement of a proper place for Arab and Muslim states in the international system. A key issue that world powers turn a blind eye to is the fact that even if religion constitutes the bedrock of autocratic legitimacy and frames public discourse, religiosity is in flux with youth increasingly embracing the notion that faith is a private affair rather than a ritualistic adherence to laws and a set of ironclad beliefs. Closely related is the failure to realize that the gap between the Middle East and the West and potentially with China and Russia is not one that is rooted in values but in policies. As a result, anti-immigrant sentiment coupled with Islamophobia, reducing the Middle East to concerns of migration and extremism, support for autocratic regimes, indifference towards the worsening plights of huge population groups, and the lack of even-handed policies towards key conflicts like Syria and the Israeli-Palestinian dispute threatens to turn the fictional value gap into a self-fulfilling prophecy. It is a prophecy that is exploited by extremists who unlike world powers understand the power of and beneficial focus on emotions. The self-fulfilling prophecy is underwritten by decades of failed policy in which military interventions, debilitating attempts at regime change, misconceived notions of nation building and misconstrued calls for reform of Islam have fuelled mayhem and crisis. “What the Arab world may need is not a religious leader but rather a social leader; not someone who wants to reform religion, but who wants to reform society…one who uses the popular legitimacy and the authority of religion to promote social and political change. Islam may need a Martin Luther King Jr. more than a Martin Luther,” Mr. Sabadell said. Stopping failed policies from cementing false perceptions in a self-fulfilling prophecy will take more than counter narratives, political messaging and promotion of ‘moderate’ Islam. It will require fundamentally revisiting the notion that support for self-serving autocrats whose policies contribute to the threat of the prophecy is part of the solution. The crisis in the Middle East offers the West a historic opportunity in the far larger struggle with China and Russia for a future international order. It is where the West has a strategic advantage that it can exploit if it is capable of dropping its horse claps that allow it to see primarily only the threats of migration and extremism.